Let’s say I am launching an adulterous cheating site similar to Ashley Madison. But users must divulge their real name and intention to everyone on the site except their spouses. How successful do you think this site would be? It would bomb! Which brings me around to job searching with LinkedIn Open Candidates. Now, I am not implying that someone quietly looking for a new job is like a cheating spouse. The similarities end with both needing to be extremely discreet. And both would be fearful of the consequences if their intentions became known. On the surface, LinkedIn Open Candidates seems like a well-intentioned tool for members who want to signal they are open to new opportunities. LinkedIn even makes the effort to achieve anonymity for members by not listing their job-seeking preference on public profiles. They also block employers from seeing their employees Open Candidates status. Unfortunately, it pretty much ends there. Open Candidates is visible to anyone who pays for LinkedIn Recruiter, including third party recruiters. The dilemma deepens because an employer can simply ask anyone outside the company to see if current employees are on Open Candidates. The percent of LinkedIn members who elect to use Open Candidates speaks volumes. As of late 2017, 10 million LinkedIn members have turned on Open Candidates. Compare this to the more than 500 million users. This means just 2% of LinkedIn members are interested in the program. According to LinkedIn research, 25% of their members are actively seeking a new job. The low 2% Open Candidates adoption rate shows how much of a failure the program is. The old saying that it is easier to keep a customer than to attract a new one may or may not be relevant to employee retention. But a cottage industry servicing the retention of employees could be built upon the Open Candidates feature. In an extremely competitive market where employers are already scanning Indeed and installing email sniffing technology to ensure that their employees are not being poached, checking employee’s Open Candidate status is just another preventative effort. In the end, “do nothing” is as great an enemy of Open Candidates as any privacy concern. Recruiters who overly rely on Open Candidates will be missing out on a vast number of people who may be open to new opportunities. In the age of big data, Open Candidates is useless. LinkedIn doesn’t need it to know when a member is interested in new jobs. They monitor user activity. Not just members clicking on job ads, but infrequent users who now log in regularly, updating their profile, adding connections, asking for testimonials, and so on. All signals that they are ready for a new job. Open Candidates serves a function for those not yet ready to post their resume on Indeed but who are a little bit dissatisfied with their current job. It’s a valid part of an employee’s arsenal, but not to be overly relied on. As one of the key features used to sell LinkedIn’s very expensive Recruiter Corporate tool, Open Candidates falls completely flat. 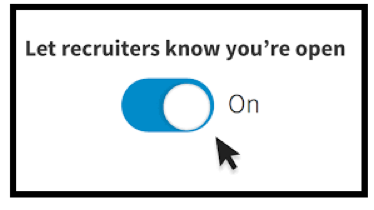 Until LinkedIn enacts a “do not recruit” list, it would be wise to consider everyone open to new opportunities, regardless of their implied status.